We’re Close To A New A-F Grading System, But How Is It Different? The State Board of Education will vote on the proposed plan to change the current A-F model at its October 15 meeting. When it comes to a math test or an English paper, an A-F grading system is pretty simple: get a question right, get a point. Don’t include a topic sentence, lose some points. This series of mistakes and successes accumulates into a letter grade, telling a student their score on the assignment. The Indiana Department of Education uses a similar process to grade schools and school districts, using the standardized test scores of students. But after criticism of the system’s complexity fueled by the Tony Bennett scandal, the General Assembly mandated the State Board of Education and IDOE change the process to assign these grades. So last week, the A-F panel presented to the State Board of Education a new way to calculate these grades, and below are some of the main takeaways of this new system. It’s important to note however, this is still just a proposal. The SBOE didn’t vote on this plan, but expects to make a decision at its October 15 meeting before getting approval from the legislature. First Off, how does the current system work? This video does a good job of explaining the current system, but we’ll also look at an example situation with a fictional third grader in Bedford. This year, his math ISTEP+ score is 400, not a passing score. Then, the state puts him into a group of other students, from all over the state, who also scored a 400. So the next year, our Bedford student is now a fourth grader, and he improves his math score to 450, which is passing, and exciting because he made a big jump. But this next part is what legislators said is unfair. Remember he’s in that group of kids who all got a 400 last year. The kids could be from Gary, suburban Indianapolis or Muncie, and his new score of 450 is compared to their growth. So now it becomes how he improved in comparison to the other kids. Maybe his 50 points is huge for this group, maybe it’s average, but it’s not just his score anymore. To be considered high growth, which would help boost his school’s score, he needs to be the best in this group. And this is the system the legislature said needs to go away. Under the system the A-F panel proposed, there are more categories a student can fall into. So where before it was fail, pass or pass plus, there’s now three failing categories, three passing categories and two pass plus categories, so a student can show improvement within a range of scores. This table shows the proposed categories for a students ISTEP+ score and what that score's growth would do for the school's overall A-F grade. Using our Bedford student again, his score jumping from failing to passing would only be compared to itself. And these growth points would go toward the school’s overall A-F score. 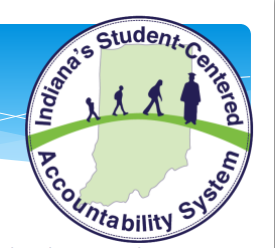 Those at the meeting who helped create the system said student ISTEP+ scores will determine half of a school’s letter grade and the other half will be determined by student growth on those tests. State superintendent Glenda Ritz was excited about the new plan, saying it made more sense to families and students. Derek Redelman, the Vice President for Education and Workforce Development Policy at the Indiana Chamber of Commerce, says this new plan doesn’t solve all the problems with our current system. He says if a student moves between categories, like our example kid from Bedford, their growth is only compared to their previous scores, but this scenario is not the norm. Redelman says the relative growth he mentions means comparing students to other students who perform at a similar level, just using different criteria than before, which according to him, is no different from the current system. Redelman and panel member Jim Snapp both told StateImpact they felt stuck with this plan. After a year of inconsistent meetings and lack of needed information to run other models, Redelman and Snapp said they thought this was the best option they could present to still make the deadline. If the SBOE sees the same flaws with the plan, they can tweak it before submitting it to the General Assembly for final approval.